Jim began the “Punta Exclamitiva” project in 2004, once the Nebbiolo vines he planted at Bien Nacido Vineyard had reached 10 years of maturity. It is produced in minuscule quantities only when the vintage calls for it. 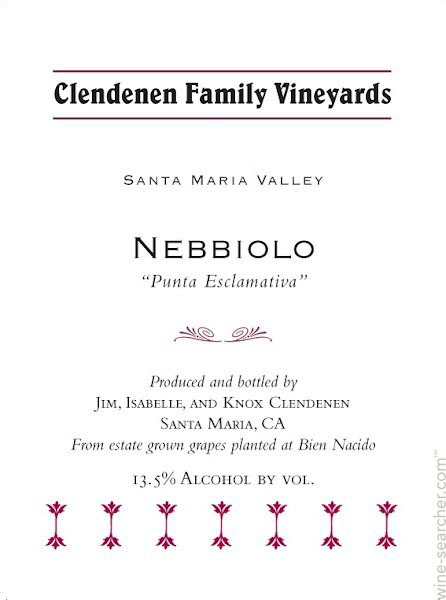 In 1994 Jim planted two acres of Nebbiolo at Bien Nacido Vineyard on a windswept hillside. The planting faces southwest, which gives this block maximum sun exposure to help these slow ripening grapes to mature. Jim chose to plant the two best clones of Nebbiolo, Lampia and Michet. In this “Riserva-style” bottling Jim uses exclusively the lower yielding Michet clone, which is the virus free Gaja clone. All of the fruit is carefully hand picked and sorted in the vineyard. The grapes are destemmed and fermented in 5 ton, open top fermenters. The must is punched down at least twice a day and pressed at dryness. The wine is aged in 100% new 500L Hungarian oak puncheons for 6 years.